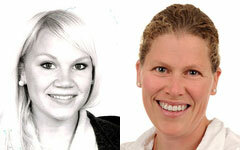 Emily Helgesen and Solveig Fossum-Raunehaug (photo) from Kirsten Skarstad's group at the Department of Molecular Cell Biology at the Institute for Cancer Research are joint first authors on an article recently published in "Nucleic Acids Research" (journal impact factor 8.8). In this paper they demonstrate how specific protein complexes that dynamically bind the new DNA generated by the replication forks organize the newly replicated DNA at a considerable distance from the replisome. In this study we have characterized the dynamics and organization of DNA during the cell cycle in the model organism Escherichia coli. One of the main discoveries was that the SeqA protein, which binds newly replicated DNA, organizes the two newly synthesized DNA molecules at a considerable distance behind the replisome. The two sister DNA molecules bound by SeqA were, in contrast, found to be localized close together in the majority of the cell cycle. This means that homologous DNA molecules are kept in close proximity to each other in a period after replication fork passage. The result suggests that the stretch of DNA between SeqA and the replisome may be a favoured site for recombination and repair. Dynamic Escherichia coli SeqA complexes organize the newly replicated DNA at a considerable distance from the replisome. Helgesen E, Fossum-Raunehaug S, Sætre F, Schink KO, Skarstad K.
Nucleic Acids Res. 2015 Feb 26. pii: gkv146.